Legal problems abound in the information society. Electronic commerce, copyright, privacy, illegal and harmful content, taxes, wiretapping governments face an enormous challenge to meet the advent of the Internet and ICT with a flexible, up-to-date, and adequate legal framework. Yet one aspect makes this challenge even more daunting: internationalisation. Law is still to a great extent based on nation states, but the information society is above all a borderless and global society. Territoriality and national sovereignty clash with the need for a global approach to address ICT-law issues. Should states leave everything to the global market, or should they intervene to protect vital national interests? How can one enforce national rules in a world where acts take place somewhere' in Cyberspace? 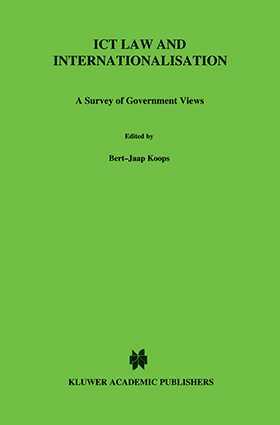 This book presents the positions on these issues of the governments of the Netherlands, Germany, France, the UK, and the US, as well as of international organisations. How do they think about co-regulation, law enforcement, harmonisation, international cooperation, and alternative dispute resolution? How do they deal with applicable law and online contracts, privacy, international liability of Internet providers, and electronic signatures? What are the implications of the European Electronic Commerce Directive and the draft Crime in Cyberspace convention? Any legal framework that is to fit the global information society must take into account internationalisation. This volume shows to what extent governments are meeting this challenge.